Boulder County, CO: Yesterday, Denver Water filed suit against Boulder County because the County is forcing Denver Water through a local permitting process for the Gross Dam expansion (see today’s Boulder Daily Camera story here). If built, the new dam would be the tallest dam in the history of Colorado and require the biggest construction project in the history of Boulder County to complete. At its March 14 hearing, the Boulder County Commissioners voted unanimously that Denver Water is required to go through the “1041 permit” process for the dam expansion (see previous Boulder Daily Camera story here). The lawsuit will try to overturn the County Commissioners’ decision. 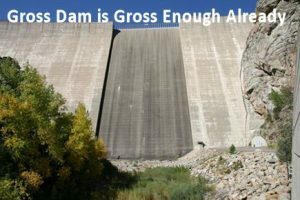 Denver Water proposes to massively increase the size of the dam to divert and store more Colorado River water that would be piped under the continental divide down into Gross Reservoir and then out to the sprawling Denver metroplex. Over 250 people attended the March 14 hearing at which every Boulder County citizen spoke passionately in favor of requiring Denver Water to go through the permitting process. The construction project is predicted to last up to 7 years with large-scale negative impacts to homeowners living around the reservoir and on the curvy mountain roads leading to the reservoir, as well as to tens-of-thousands of acres of public lands in the area which are a recreational mecca for county residents. The new lawsuit would now extend a decade-long battle over the massive dam expansion. In 2018, Save The Colorado and five co-plaintiffs filed suit in federal district court in Denver against the U.S. Army Corps of Engineers which gave a permit to Denver Water to expand the dam (see previous Boulder Daily Camera story here). The project is also awaiting a “license amendment” from the Federal Energy Regulatory Commission. Denver Water’s water use is going down, not up, due to water conservation programs. Boulder County and environmental groups contend that Denver Water doesn’t need more water and instead should be spending more money on tried-and-true conservation programs to meet its needs (see press release here). Will the Colorado River Get Fracked? “The San Juan Headwaters Project”: We are keeping an eye on it.